this week, an interesting luk thung curiosity: a sayan sanya - waeo mayura supercut! 2 of the earliest releases from the bangkok cassette company were sayan sanya's original "khwam rak muean ya khom" album (BCC-001) and waeo mayura's answer album (BCC-003).. this cassette (BCS-009) features the vocal tracks of those 2 cut together to form a "duets" album. to someone familiar with the previous recordings, the effect can be a little jarring, but overall the mix is pretty successful. the backing tracks are the platonic ideal of late-70's luk thung, mostly being of a slow, syrupy, string-sax-&-electone-heavy bent. enjoy! this week, we'll hear from one of luk thung's great sentimental balladeers, miss sunari ratchasima! hailing from nakhon ratchasima, sunari rose from local song contest champion to a national recording star. crafted for her full-bodied voice and impressive range, sunari's songs were particularly popular in the country's semi-professional café scene, where singers would invariable tackle one of her songs to prove their mettle. 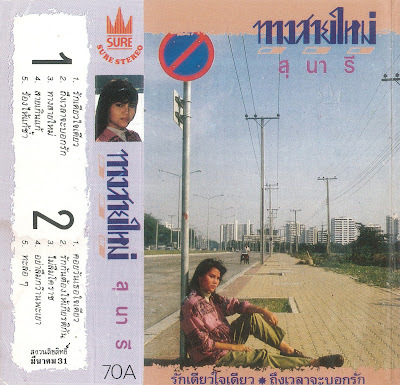 this 1988 cassette from sure audio finds sunari in front of a synth-driven band, backed up by a team of songwriters like chiw phichit, chonlati thanthong, kong katkamhaeng and others.. even a famous indonesian melody finds its way here. enjoy! this week, we have a taste of spiritual lae music from achan prasit nakhonphanom. "do you know what results you receive from your various merit-makings?" asks the cover of this cassette from soemwit music, and in a series of lay sermons, achan prasit breaks it down for you. the karmic benefits of donating food & clothing to monks, ordaining as a monk yourself, helping to build a monastery, etc. are demystified for the inquiring listener, over a typical lae musical accompaniment rendered by a keyboard workstation.. enjoy!